4. Reflect before we get too far into next paper. Read comments carefully, then log in to Turnitin. Hover over the little i to read the instructions. Do a screenshot of that black box with the questions in it. Drag the screenshot into a Google Doc or pages document. Complete the Essay Reflection questions in Google Drive or a new document, then upload as PDF or .doc. 5. Assignment: Edit those first 3 sections, read non-fiction, be ready to start research next week. Mrs. Kistler will do a non-fiction presentation. After her presentation, go to library to pick out book. Our final novel of the year will be a Vietnam-era choice starting the first week of May, so I'd like you to have a non-fiction book to read during April while we are working on research paper. At minimum, we'll do a couple of journal posts and will likely also do a brief book talk later in April. 1. In your Google Drive, go back to the document called Spring 2017 I-Search Paper Topics. 2. Scroll down to page 4 of that document. Yesterday, I added more topics & questions from last year. 3. Go to the document called Honors I-Search Topics Google Doc. I made comments on your questions! 4. Finish the first 3 sections of paper for Peer Review on Thursday (Why I Chose Topic, What I Already Know, What I Want to Know). 5. Think about sentence variety as you write. Watch overuse of "I" at the beginning of sentences. Vary openers! ​6. Once you finish paper pieces, READ your new book! 2. Take 2 minutes to Find I-Search template in Google Docs. Follow the instructions to get paper set up. Read through each section. See Sample #1 below--use red boxes! the top of your list of assigned articles. Answer the 4 questions. 2. Write the 1st three sections of paper (Why I Chose Topic, What I Already Know, What I Want/Need to Know). Notorious Confusables Continued: Last grammar lesson of the year! We use our everyday dishes every day. 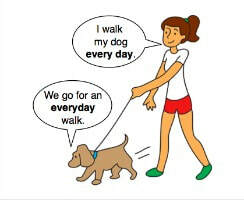 Everyday is an adjective meaning "daily" or "average." Jogging 3 miles is an everyday occurrence. Every day is a time expression that means "each day." I jog 3 miles every day. The Last Grammar Lessons of the year!! Use fewer with countable objects (desks, books, students). Please don't sit next to anyone. Complete the registration process. Be thorough! Print out the bar code, put in career folder, bring the bar code to the fair. The bar code is the method that the colleges, vo-techs, reps, etc. will use to get your information. If you stop at their booths, they'll scan your card. **You need to SHOW me your printed bar code before putting in folder. On that Weds., you'll retrieve the printed bar code before we leave. MUG: *Another common ACT error deals with parallel structure. What is it? 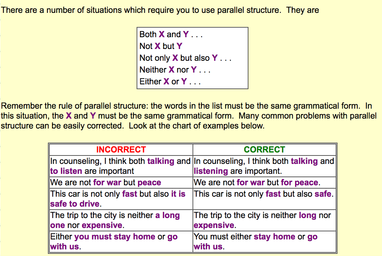 Multiple items of similar content in a sentence must be expressed in the same form grammatically. Incorrect parallelism: Mary likes hiking, swimming and to fish. Correct parallelism: Mary likes hiking, swimming, and fishing. or Mary likes to hike, to swim, and to fish. 4. Practice at ChompChomp--scroll down to howling dog to start! SEE the Yellow Box on the right! Parallel structure is just like equal equations in math! Whatever comes after not only must also come after but also! Both 26 pts. I'll record the better score. A misplaced modifier is one that is in the wrong place within the sentence. It is not close enough to the word it’s supposed to modify, so it causes confusion (and sometimes very funny sentences). I watched the bulls charge through my binoculars. ​After the kids left their rooms, I cleaned them. They walked into the tavern and ordered a drink that was dirty and filled with cockroaches. Do you see how a misplaced modifier can change the whole meaning of a sentence? They are good for a chuckle—but not for good writing! 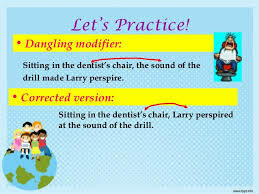 Dangling=When a sentence begins with a modifying phrase, the intro must be immediately followed by a comma and then the noun it's describing. Though exhausted, it would be another hour before Zoe got to go home. Though exhausted, Zoe wouldn't get to go home for another hour. Running toward the lake, the trees were swaying in the wind. Fix 1: Running toward the lake, I saw the trees swaying in the wind. Fix 2: As I ran toward the lake, the trees were swaying in the wind. Only Cheryl eats grapes.=Cheryl is the ONLY one who eats them. Cheryl only eats grapes.=This means that Cheryl only does one thing with grapes: She eats them. She doesn’t squish them into wine, she doesn’t throw them at people. She only eats them. Cheryl eats only grapes.=This means that Cheryl eats nothing else but grapes. 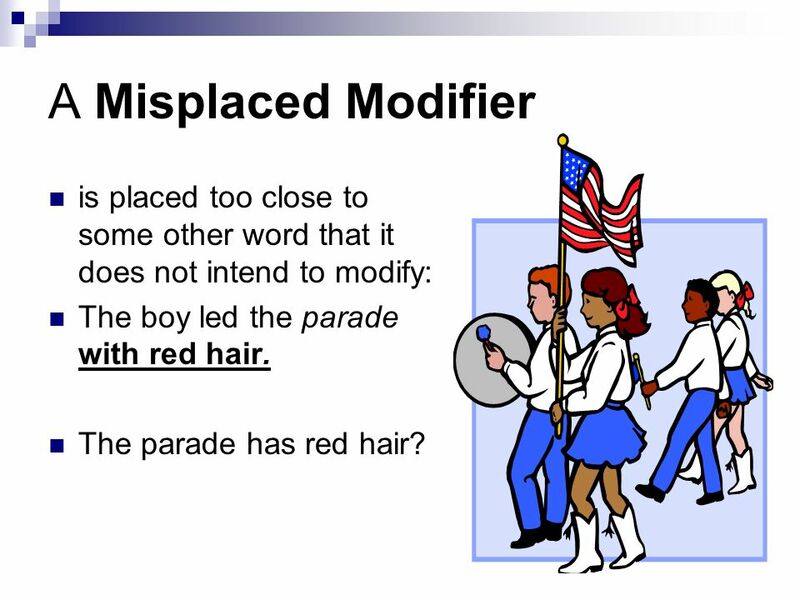 Hint: When a modifier begins a sentence (followed by comma), the very next thing that comes along HAS to be something that can, in fact, be modified by that phrase or clause or it's dangling. What is the difference between Misplaced and Dangling? Now spread out--sit on opposite sides of table please; I'll record better 2 of 3 of these.